Central and Eastern Europe, Past and Present. Recent Revelations from the Stasi Archives. The past few days have seen a series of fresh revelations about the notorious East German Secret Police – the Stasi. Firstly, previously classified documents released from the Stasi archive have revealed that East German officials were secretly negotiating the extradition of notorious Nazi War Criminal Alois Brunner from Syria during the 1980s, an event which failed to transpire due to the revolution of 1989. However, the West German intelligence agency BND also recently admitted to the shredding of a 518 page secret file on Brunner during the 1990s, leading to claims of a cover up and allegations that Brunner may have been working as an informant for the BND after he became resident in Syria in the 1950s in return for high level ‘protection’. Secondly, evidence has emerged to suggest that the Stasi may have played a larger role in the 1967 shooting of student Benno Ohnesorg than previously thought, an event which is widely credited as the catalyst for the radicalisation of the West German left. Karl-Heinz Kurras, the Berlin policeman who shot Ohnesorg had previously been ‘outed’ as a Stasi agent in 2009, a development which spawned a new investigation into Ohensorg’s death. Now a leaked prosecutor’s report has claimed that Kurras fired at Ohensorg deliberately. The report has also given rise to claims that that Horst Mahler – a founding member of the radical Baader-Meinhof gang, who conducted a violent terrorist campaign during the 1970s, during which time many of their members were given refuge in the GDR – also worked as an inoffizielle Mitarbeiter (informal collaborator) for the Stasi until 1970. However, my favourite Stasi-related story this week has to be the publication of this collection of archived images. The photographs, unearthed from the Stasi archive by photographer Simon Menner and published this week by Spiegel Online, were originally taken as part of a course designed to teach Stasi officers ‘the art of disguise’ and show individuals clad in various guises! 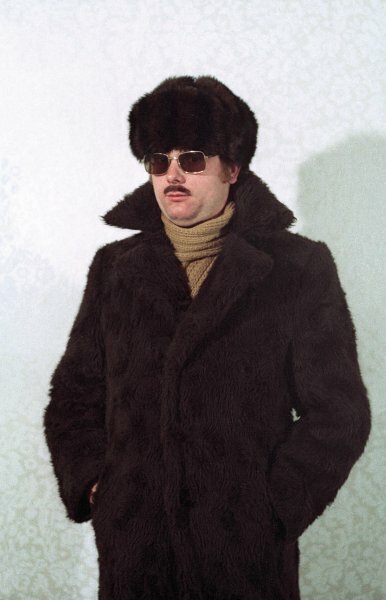 Stasi Chic: fur coat, fur hat and the obligatory sunglasses! 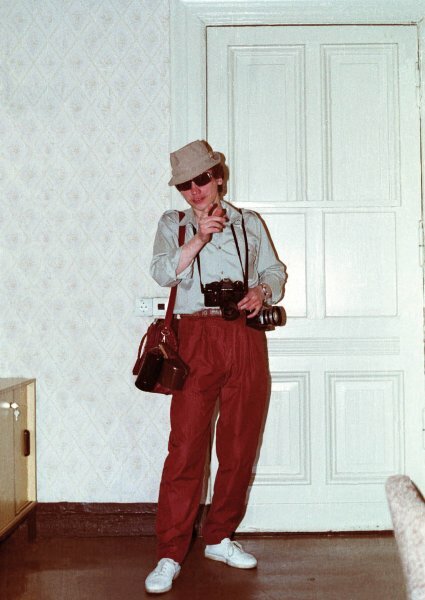 ‘Tourist with Camera’ – a favoured disguise used by Stasi surveillance agents. These photos are rather amusing, reminiscent of bad 1980s spy movies involving secret agents with fake moustaches who look anything but inconspicuous – and having viewed the photos, I couldn’t help but conclude that had I been a citizen of the former GDR I probably would have suspected anybody who wore sunglasses of being a Stasi officer! Other photographs in the collection have more sinister undertones however, including photographs of private homes – taken before the Stasi conducted secret searches, in order to document the rooms so that they could later be restored exactly to their previous condition to hide any traces of their presence. Herr Christian goes on to confess that he still works as a private detective today, so is ‘pretty much doing the same job now as back then’. And Herr Christian is by no means an isolated case – after the fall of the Berlin Wall tens of thousands of ex-Stasi men sought alternative employment as private detectives, security agents and policemen (see this Spiegel article on ‘Stasi Recycling’ for more details). So, even today, many former Stasi agents seem to have found it difficult to leave their former ‘spy games’ behind. For more on the Stasi, see the previous post by guest author David Cook ‘Living with the Enemy: Informing the Stasi’. Dr Kelly Hignett is Senior Lecturer in History at Leeds Beckett University. Kelly’s research interests relate to twentieth century central/east Europe with a particular focus on Czechoslovakia. This includes: state-sponsored terror, repression, imprisonment and forced labour; show trials and political persecution; criminality, social deviance and dissent; the evolving relationship between state, society and experiences of ‘the everyday’ under communism; women’s experiences of communism, and nationalism, state-building and identity construction in modern central/east Europe. More generally, Kelly is also interested in methodological approaches to life writing, personal narratives and oral testimonies; histories of imprisonment and forced labour and the history of crime on a more broadly comparative and transnational basis. Hignett, K, Ilic, M, Leinarte, D and Snitar, C, Women’s Experiences of Repression in the Soviet Union and Eastern Europe (Routledge, 2017). Hignett, K, ‘”We had to become criminals to survive under Communism!”’ Testimonies of Petty Criminality and Everyday Morality in Late Socialist Central Europe’ in Ilic, M and Leinarte, D (Eds.) The Soviet Past in the Post-Socialist Present: Methodology and Ethics in Russian, Baltic and Central European Oral History and Memory Studies (Routledge, 2016). K Hignett, ‘Transnational Organised Crime and the Global Village’ in F Allum and S Gilmour (eds), The Routledge Handbook of Transnational Organized Crime, (2011). K Hignett, ‘Crime in Communist and Post-Communist Eastern Europe’, Law, Crime & History, (2011).